Goa Food Festival is an event that took place between 08-Dec-2006 and 17-Dec-2006 in Hyderabad. Goa doesn't remind most people first of food, but it should, as this week at Central Court seeks to aver. The Central Court Hotel at Lakdi-ka-Pul is hosting a food festival of Goa, Viva Goa - The Food Carnival, from 8th to 17th of December. 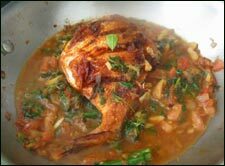 The menu boasts of some exotic dishes from the food-loving and food-plenty state of Goa. The dishes of the festival are available a la carte for lunch, and buffet for dinner. The buffet is priced at Rs. 299 excluding taxes, and contains Fish Caldine (mildly spiced coconut and turmeric fish curry), Seafood Caldeirada (seafood poached in a white wine sauce served with sauted vegetables), Balchao de Camaro (spicy prawns cooked in a tangy shrimp and feni sauce) and Peixe Reachado (a seasonal fish stuffed with a spicy homemade Goan masala and fried). Then there's the Iscas de Galinha (fried chicken liver), Caldo Verde (bland Portuguese potato broth with diced greens), Galhina Piri-Piri (chicken pieces marinated in a mild mixture of piri-piri and Goan herbs, before being fried), the quintessential Portuguese delicacy Chicken Cafreal (chicken marinated in a mildly spiced green coconut masala and fried) and the all-time favorite, Chicken Xacuti (Chicken cooked in a paste made with roasted aromatic spices and coconut). The cuisine of Goa has special treats for the vegetarians too - Cashew Green Peas Bhaji (a tangy mixture of cashews, green peas, spices and fresh coconut), Sprouted Moong Ussal (bean sprouts with mustard seeds, green chillies and fresh coconut) and the Alsandachem Tonakh (kidney beans with a spicy Xacuti gravy). You can also try out the range of desserts. End your meal on a sweet note with Tender Coconut Souffle and Bebinca (a traditional seven-layered coconut and jaggery dessert)or Bolo Sans Rival (a sweet cashew nut based cake with a layer of biscuit), which is a unique blend of flavors and textures that's sure to have you asking for more. For further details, please contact the hotel at 2323-2323. Be the first to comment on Goa Food Festival! Just use the simple form below. fullhyd.com has 700,000+ monthly visits. Tell Hyderabad what you feel about Goa Food Festival!